MySignPrinter.com is a division of SS Graphics, Inc. Established in 2001 as an online source for screen printed yard signs and sign related products. Our midwest location (South East Michigan) allows us to provide cost effective shipping and product manufacturing for the contiguous 48 states. Owned and Operated by SS Graphics, Inc.
To provide a low cost, high quality and reliable wholesale source for screen printed signs. We always welcome your call! Yard signs are used everywhere. They can be used for advertising to promote businesses, events, or political campaigns. MySignPrinter.com manufactures cheap yard signs without sacrificing quality by using a state of the art screen printing process (read more about our process below). Our corrugated plastic signs and weatherproof poster board signs are screen printed with environmentally friendly UV inks for indoor and outdoor durability. At MySignPrinter.com we use semiautomatic M & R Saturn screen printing press for the printing of our wholesale yard signs. We print thousands of corrugated plastic and posterboard yard signs everyday. In addition to using our semi-automated screen press, we also use environmentally friendly Ultra Violet curable screen printing inks in our production process. UV inks are cured with state of the art Vitran UV Reactors. MySignPrinter.com uses environmentally friendly Ultra Violet curable inks for screen printing our corrugated plastic yard signs. UV inks are about as environmentally friendly as screen printing inks can get, because they produce almost zero emissions. Unlike conventional screen printing inks, UV inks do not contain any solvents. The solvents used in traditional air-dry screen printing inks evaporate as the inks dry releasing Volatile Organic Compounds (VOCs) into the atmosphere. VOCs are harmful in two ways: First, they are a key cause of air pollution creating harmful pollutants like ground-level ozone. Secondly, some VOCs are classified as Hazardous Air Pollutants and harmful to people who work in or near traditional air-dry screen printing facilities. Air-dry screen printing inks may be subject to special regulatory controls under the Clean Air Act. 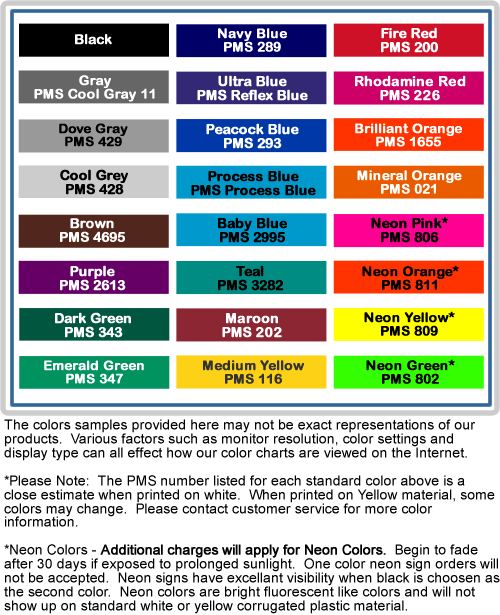 MySignPrinter.com only uses UV curable screen printing inks in our yard sign production facility. UV screen printing inks do not actually dry in the printing process, they cure. Although UV screen printing inks look like traditional liquid solvent based inks, they are very different. UV inks look like liquids but they are actually solids. They remain liquid until they come into contact with intense Ultra Violet light generated by UV reactors. When an UV ink is exposed to intense Ultra Violet light it cures instantly – that means no drying time. This instantaneous curing allows SignOutfitters.com to produce many more yard signs per day than if we used conventional solvent based air-drying inks. Our yard signs can be handled and packed for shipping immediately after they emerge from the UV reactor. In a nutshell this means that we can produce a cheap yard sign quickly without sacrificing quality. So whether your customer needs an advertising yard sign to promote their business, a political yard sign to promote their election campaign, or a real estate yard sign make us your wholesale source for all of your signage needs.